Barack Obama would lose badly to Ronald Reagan!!! By the way, the margin might be even bigger than I’m reporting. As you can see from this press excerpt, all we know is that 58 percent of respondents said they would vote for Reagan. I’m assuming that 42 percent would vote for Obama, but it’s possible there was also a “don’t know” or “other” category, so maybe Obama would be under 40 percent! …just about everything about the era — from the politics, leaders and safety to the music, TV shows and blockbuster movies — are seen as being better than they are today. In fact, 3 in 4 Americans (74%) thought that our country was better off then and even safer (76%). The same amount (76%) believe that government ran better in the 1980s than it does today. 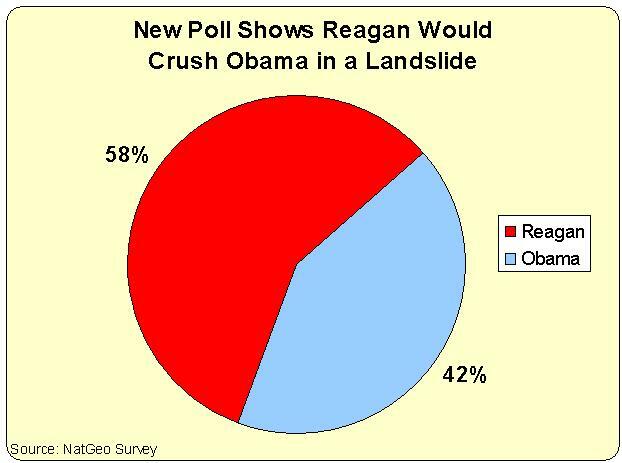 And if a presidential election were held today, 58 percent would vote for Ronald Reagan over Barack Obama. Americans ages 18 to 34 were evenly split, with 51 percent favoring Reagan and 49 percent Obama. Even young people preferred Reagan over Obama, which is remarkable since they didn’t experience the Reagan years and largely have learned about the Gipper from the media and schools, both of which are very hostile to Reagan. We shouldn’t be too surprised by these polling results. Just take a look at this amazing infographic, which shows Obama’s horrible record on jobs compared to Reagan and other Presidents. Michael Ramirez makes the same point in this very funny cartoon. Or look at these powerful charts based on Minneapolis Federal Reserve data, which compare the strong results of Reaganomics with the pathetic results of Obamanomics. In other words, good policy leads to good outcomes, and good outcomes yield political rewards. That simple lesson has been lost on the weak gaggle of big-government GOPers who followed Reagan. But our hypothetical polling results show that Americans today are still ready to rally behind a candidate who offers a compelling message of freedom and prosperity. That’s yet another reason why I’m still optimistic about the fight for liberty. P.S. Here’s some snarky humor comparing the Gipper with Obama. And if you liked the story of what happens when you try socialism in the classroom, you’ll also enjoy this video of Reagan schooling Obama. P.P.S. If you want to be inspired, click here and here to see two short clips of Reagan in action. You advertise the dates on which President Reagan talked about balancing the budget. Such a fine talker, I agree. I would have thought you would have more regard for President Clinton who, ahem, both balanced the budget and delivered operating surpluses. John 1 is all very well, but reality that matches the word is nice to have, too. You are right about the fact that Bill Clinton should have received my praise for balancing the budget and delivering surpluses and that is the case too. Look at this links where I have praised him for working with Newt and the conservative congress (unlike Obama) and cutting spending. Thanks for bringing up this point and I do agree with your observation about Clinton takes the deficit spending problem on and doing something about it. I got to meet Bill Clinton several times while he was governor in Arkansas and the first time I met him the person sitting next to me said that he was most likely going to be president one day. I grew up in Memphis and had never even seen an elected official but when I moved to Little Rock in 1983 the first week I saw Bill Clinton, and two senators and one congressman all in person. I was told it was because I worked in downtown Little Rock and the elected officials were in the capitol city a lot. Over the next 10 years I ran into Clinton almost weekly at grocery stores, movie houses, restaurants, churches and ball games. I have friends and relatives that are FOB’s (Friends of Bill) and they have spent nights in the Lincoln bedroom at the White House. Being in a small state like Arkansas and having a president come from there has been an interesting experience.